TED, the non-profit devoted to Ideas Worth Spreading, and WNET, in partnership with PBS and the Corporation for Public Broadcasting (CPB), are co-producers of TED’s first-ever original television special featuring content created and curated exclusively for the one-hour show, airing nationally on PBS on Tuesday, May 7, 2013 at 10 p.m. EST. TED Talks Education features a mix of teachers and education advocates delivering short, high-impact talks on the theme of teaching and learning. The special, hosted by musician and education advocate John Legend, was taped before a live audience in the BAM Harvey Lichtenstein Theater of New York’s Brooklyn Academy of Music. TED Talks Education is part of American Graduate: Let’s Make It Happen, a nationwide public media initiative made possible by CPB to help communities identify and implement solutions to the high school dropout crisis. The program also features two short films profiling high school students with remarkable stories. The documentaries were produced by two-time Emmy-winning filmmaker Tony Gerber and Pulitzer Prize-winning playwright and MacArthur Genius Award-recipient Lynn Nottage. TED Talks Education is curated by TED’s Chris Anderson and is executive produced by TED’s Juliet Blake and WNET’s Julie Anderson. See the full list of television broadcast credits. TED is a nonprofit organization devoted to Ideas Worth Spreading. Started as a four-day conference in California almost 30 years ago, TED has grown to support those world-changing ideas with multiple initiatives. The two annual TED Conferences invite the world’s leading thinkers and doers to speak for 18 minutes on a diverse mix of topics. Many of these talks are then made available, free, at TED.com. TED speakers have included Bill Gates, Jane Goodall, Elizabeth Gilbert, Sir Richard Branson, Nandan Nilekani, Philippe Starck, Ngozi Okonjo-Iweala, Isabel Allende and former UK Prime Minister Gordon Brown. The TED2014 Conference will take place next spring in Vancouver, British Columbia, along with the TEDActive simulcast in neighboring Whistler. The annual TEDGlobal conference is held each summer in Edinburgh, Scotland. American Graduate: Let’s Make it Happen is helping local communities identify and implement solutions to the high school dropout crisis. 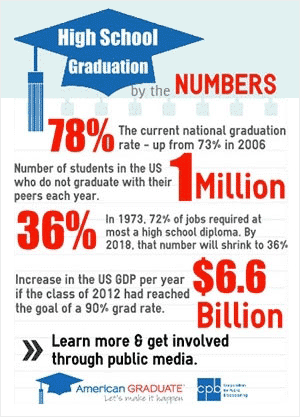 American Graduate demonstrates public media’s commitment to education and its deep roots in every community it serves. Beyond providing programming that educates, informs and inspires, public radio and television stations — locally owned and operated — are an important resource in helping to address critical issues, such as the dropout rate. In addition to national programming, more than 75 public radio and television stations in 33 states have launched on-the-ground efforts working with community and at risk youth to keep students on-track to high school graduation. More than 800 partnerships have been formed locally through American Graduate, and CPB is working with Alma and Colin Powell’s America’s Promise Alliance and Bill & Melinda Gates Foundation. PBS, with its over 350 member stations, offers all Americans the opportunity to explore new ideas and new worlds through television and online content. Each month, PBS reaches nearly 120 million people through television and nearly 28 million people online, inviting them to experience the worlds of science, history, nature and public affairs; to hear diverse viewpoints; and to take front row seats to world-class drama and performances. PBS’ broad array of programs has been consistently honored by the industry’s most coveted award competitions. Teachers of children from pre-K through 12th grade turn to PBS for digital content and services that help bring classroom lessons to life. PBS’ premier children’s TV programming and its website, pbskids.org, are parents’ and teachers’ most trusted partners in inspiring and nurturing curiosity and love of learning in children. More information about PBS is available at www.pbs.org, one of the leading dot-org websites on the Internet, or by following PBS on Twitter, Facebook or through our apps for mobile devices.